A riff on a classic Waldorf salad, laced with apples three ways. 1. In a small bowl, stir together salt, spices and egg white. Add walnuts and toss to coat evenly. 2. Spread walnuts in a single layer on a parchment paper-lined rimmed baking sheet and bake in a preheated 225 degrees Fahrenheit oven (110 degrees Celsius) until nuts are toasted and the coating is dry, about 1 hour, tossing every 20 minutes. Set aside. 1. Combine apple, shallot, cider, oil and vinegar and season to taste with salt and pepper. Set aside. 1. Toss together apple rings, vinaigrette and parsley, season to taste with salt and pepper, and let rest at room temperature until ready to serve. 1. Whisk together cheese, sour cream, mayonnaise, buttermilk and vinegar until smooth and season to taste with salt and pepper. Set aside. 1. Gently toss together watercress, apple, celery, celery leaves, walnuts and cranberries with dressing and season with salt and pepper to taste. 2. To Plate: Smear remaining blue cheese dressing on each of 4 chilled salad plates and mound salad on top. 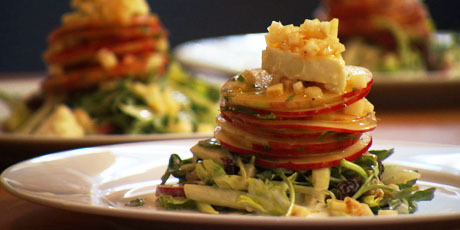 Place a stack of marinated apple rings on top of each salad, add a wedge of blue cheese and spoon over remaining apple vinaigrette. Serve immediately.